I've always loved gallery walls. Really, I've just always loved pictures. 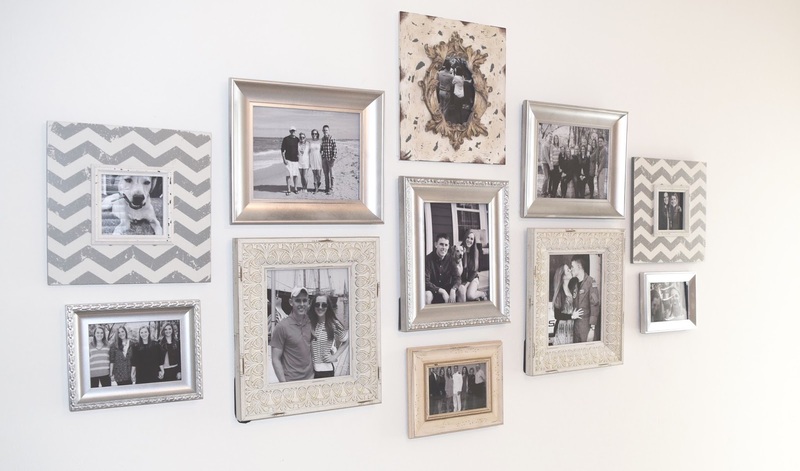 When I walk into someone's home, the first thing I do is march right over to where the family pictures are displayed. I've noticed people do the same thing when they come to my house. Pictures are just fun! Like I said, I've always loved gallery walls, but I think they are really hard to do correctly. 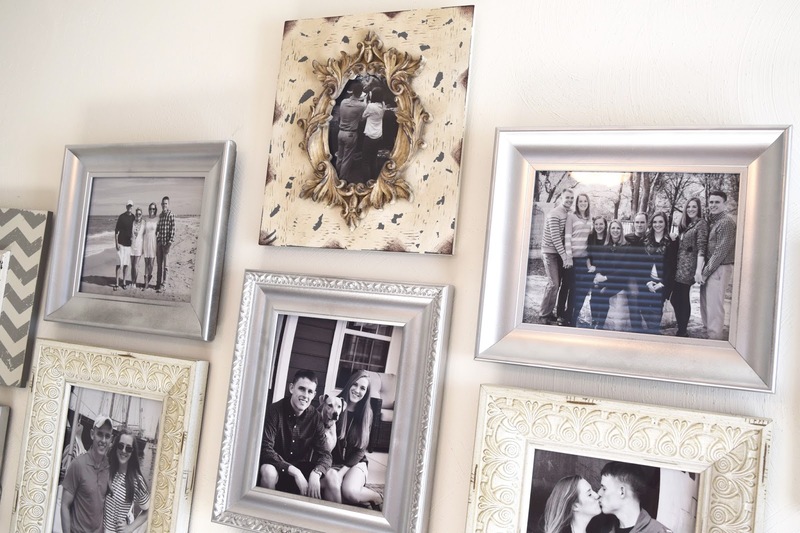 I've seen gallery walls look amazing and some that look plain junky, so I've been hesitant to try. I don't have the best eye for this stuff, so I figured anything I created would end up on the junky side. I elicited a little (read: a lot of) help from my mother-in-law while she was in town to create the perfect gallery wall for my office. Yall, I am obsessed! Even though there are 11 frames, choosing the pictures was hard! I love the ones that made the wall but would have happily selected 11 more if I had the space. I decided I wanted to do larger pictures with the majority being 8x10 photos. 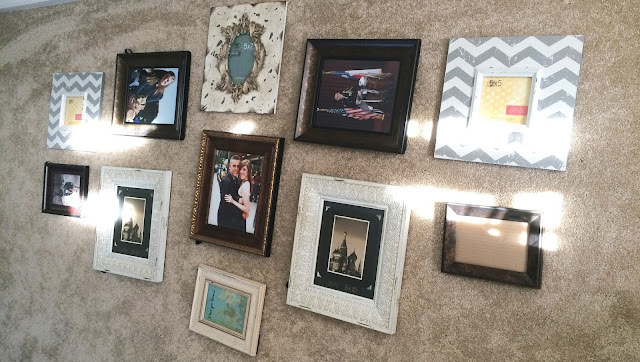 I already had six of the frames already on hand and purchase the remaining 5 from Hobby Lobby. Seriously, what would we do without that place? After deciding on a layout, I spray painted all of the old brown frames that I had on hand silver. 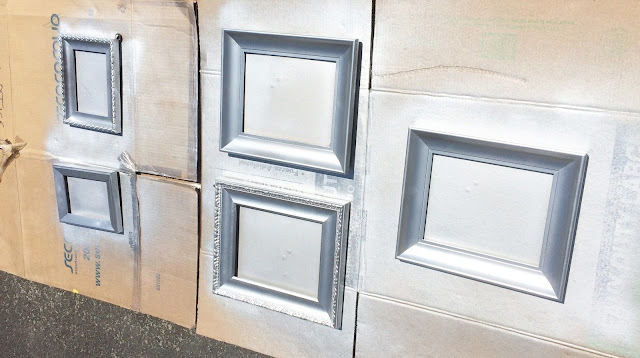 I think having several of the frames one color really helped with the overall look, and I love the shimmery silver against some of the more rustic off-whites. Hanging the frames was the hardest part, primarily because it was the only part I had to do by myself. After an average of 3-4 nail holes per picture, I finally got them looking just like I wanted! I even got the husband stamp of approval, which is always a win when it comes to decorating. I chose to go with all black and white pictures to give it a classic look. I typically love color pictures, but there is just something about the black and white collage that I find really beautiful. It feels timeless and makes me smile to see so many memories frozen in time. My office is where I spend the majority of my time during the day since I work from home, so I want it to be a room that I like looking at. This wall of pictures and memories makes me so happy, and I truly love sitting in that little room now! 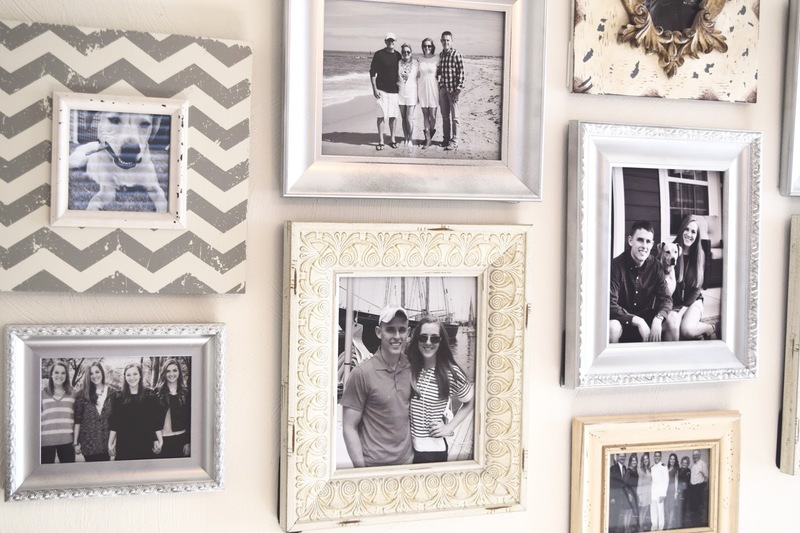 This is such a beautiful gallery wall!! I love the color scheme!! and the fact that you spray painted them = fantastic! definitely brought the whole picture (ha!!) together! So adorable! I could never pull off a gallery wall. I hung up my diploma and college awards in my work office, and it's always nice to just look at it throughout the day. Which reminds me, I probably need to put a photo of Andy on my bulletin board at the office! I am working on a wall with black and white square canvas prints. They're just so expensive so I've been buying them a few at a time! I love the frames! They look so good with the photos! LOVE this!! It looks so perfect! 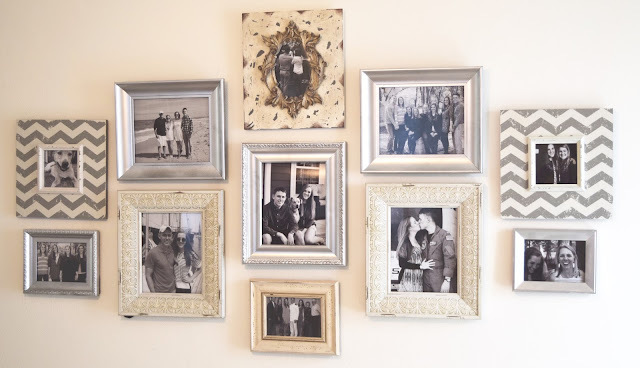 I've always wanted a wall like this, but like you said, some can look so junky, and I'm nervous... maybe I'll make it a goal to put one up at our next home! You did such an amazing job-- love the different frames and layout you picked. Love! And love the black & white... Super classic, indeed!! I saw this tip for gallery walls on instagram the other day and think it's brilliant. Tape together pieces of wax paper the size of the area you're working with and lay them on the floor. Arrange the frames the way you want them on the wax paper then trace around the edge of the frames with a marker. Tape the edges of the paper to the wall and you'll know exactly where to put the nails. Rip the paper off and you're done! I haven't done this yet but since we just moved I'm sure I will soon! I always end up with a million and two nail holes when hanging pictures. I love this! We are doing floating shelves again so I can do my gallery wall that way. 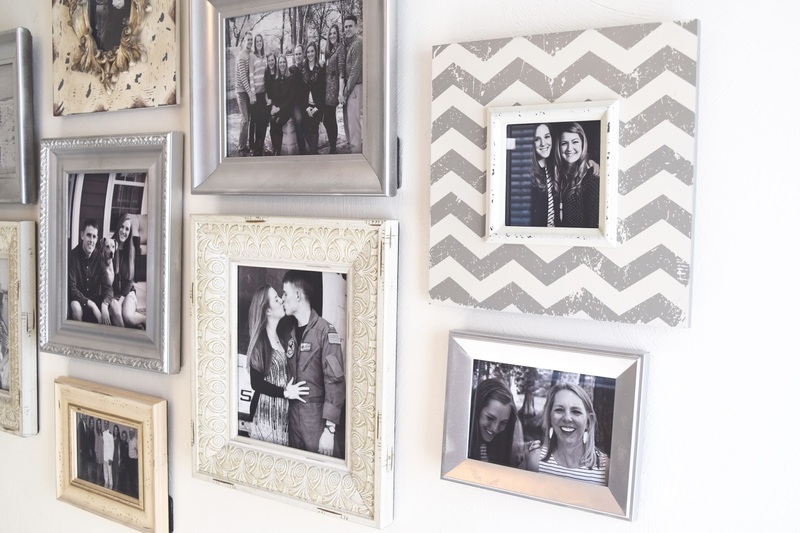 I don't know how I missed this, but I absolutely love this gallery wall! I love what you did with the silver spray paint. It really brought everything together and looks very chic and beautiful!